Matt Manfra, the senior associate vice president for alumni relations and annual giving, said the Division of Development and Alumni Relations hopes to hire a legacy alumni engagement director this fall. The University is expanding efforts to connect with siblings, children and grandchildren of alumni. Officials posted a job opening last month seeking a legacy alumni engagement director who will launch an admissions program and scholarship fund for legacy students. The director will oversee legacy admissions sessions during Colonial Weekend, a legacy first-year celebration, a graduating legacy celebration and a summer send-off program, according to the posting. “This position will be responsible for creating a University atmosphere that embraces the importance of alumni families and connections,” the job posting states. 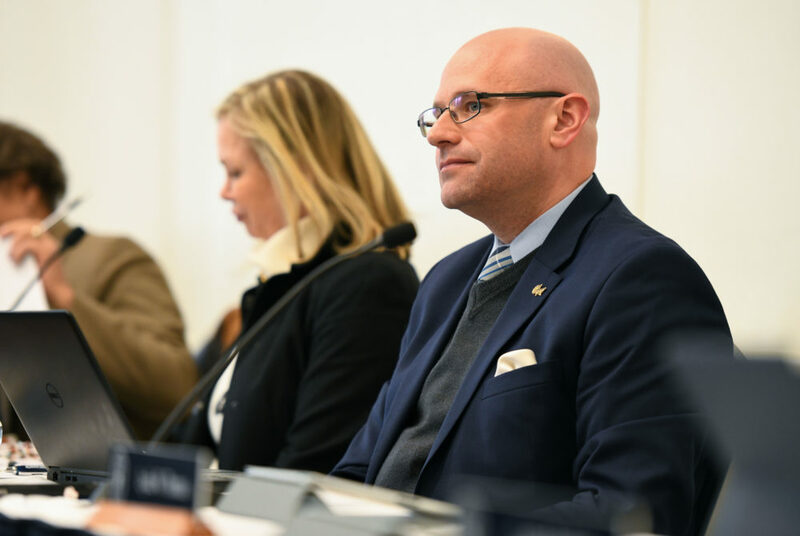 Matt Manfra, the senior associate vice president for alumni relations and annual giving, said the Division of Development and Alumni Relations hopes to hire the director later this fall. “The Director will help engage and inform alumni who have college-aged children or other family members who are interested in attending GW,” he said in an email. Manfra said the position will “expand” upon existing legacy engagement strategies and will focus on creating legacy programs during major University-wide events, including move-in weekend and Commencement. He said the division works with the admissions office to carry out the legacy programs. He said Development and Alumni Relations is not involved with the admissions office’s recruitment or enrollment decisions. Manfra declined to say what the legacy admissions program will include and why officials decided to create the program. He declined to say who will be involved in the program and when he expects it to launch. He declined to say how much money legacy students will be able to receive from the scholarship fund and where the money for the fund will come from. Connecting with alumni has been a recent focus of top administrators after University President Thomas LeBlanc named philanthropy and alumni engagement as one of his top five priorities in the spring. LeBlanc held alumni receptions across the country this spring, while the Board of Trustees created a task force last fall examining how to better engage alumni. Two of GW’s peer schools – the University of Miami and Northeastern University – have a dedicated legacy admissions program. Staff at other university legacy programs said the programs help maintain strong connections with alumni who will give back to their alma mater. Sarah Nyanjom, the director of the Admission Liaison Program at the University of Virginia Alumni Association, said the program does not make any admissions decisions but is a resource for prospective legacies. She said the program’s officials can walk potential students through the admissions process and meet with them to answer questions. Legacy status is considered during the application process at UVA, according to the alumni association’s website. “Admissions can be an overwhelming, daunting, mystifying process and so our goal is kind of to pull back that dark curtain and present very clearly what that admissions process looks like for alumni families,” Nyanjom said. Nyanjom added that legacy students are more likely to accept their place at the school than non-legacies, typically because they have closer ties to the institution. Ricky Hernandez, the chief operating officer of the University of Arizona Alumni Association, said the legacy admissions program at his school started two months ago. He said one of the main purposes of the program is to create an “enrollment pipeline” for prospective legacy students, which would also create a way for alumni parents to be re-engaged with the university. Both the University of Virginia and the University of Arizona offer legacy scholarships – $5,000 and $1,000 each year, respectively. “It’s important for us to make sure that we cultivate the relationship that we have with them so that they continue to support the program or support the university in whatever way they see fit,” Hernandez said.